A couple of weeks ago, we had a mini-Summer for a week here in Seattle. It was awesome! With temps in the high seventies (which is summer weather for Seattlelites: shorts, tees, sunglasses, sunscreen and complaints that it is too hot - keep in mind we don't have AC in our homes), I couldn't resist going for a photo walk. And yes, I got sunburned, even with 70 SPF sunscreen on. Only slightly, but the sun was a shock to my system. I came home feeling totally over done. 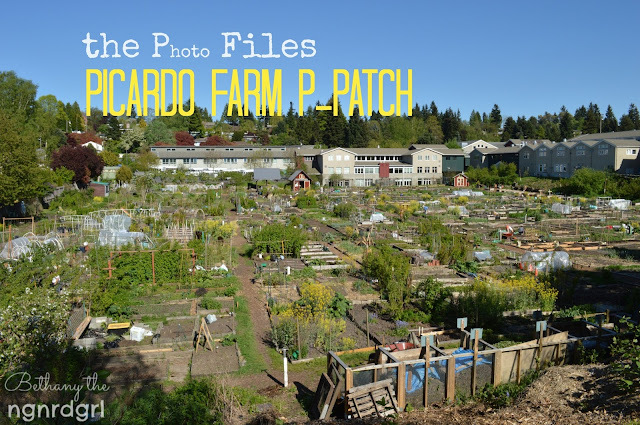 I walked down to my neighborhood p-patch, Picardo Farms, looking for something fun to photograph. I love architectural photography, so naturally the buildings at the p-patch drew me in. As a civil engineer who has taken structural engineering courses, the picnic structure was a magnet for me. I love all the shapes in the structure. Everyone seemed so busy trying to get their plants planted in the nice weather. Most of the beds were recently tilled and planted. I didn't get any pictures of people, as I would be embarrassed to have my picture taken while all sweaty and dirty. I love all the little things people do to make their beds their own. This scarecrow seemed to be doing the trick! I loved the colors in these veggies. As I was walking out of the p-patch, I couldn't help but take a picture of these bleeding hearts. I actually have a black and white photo of bleeding hearts in my darkroom photography collection that I took in Boston from 10 years ago. I like taking pictures of flowers; take my Summer Walk as an example. Bleeding Hearts Camera: NIKON D3200 Exposure: 0.013 sec (1/80) Aperture: f/5.6 Focal Length: 55 mm ISO Speed: 100 Cropped, adjusted exposure, contrast, and saturation just slightly. I love how expansive this p-patch is. Can't wait to walk around it during different seasons and see all the plants in bloom. I was quite pleased with how these turned out SOOC (Straight Out Of Camera). As I mentioned above, I have been practicing with histograms. I am planning on giving a review of what I have been studying and practicing, so stay tuned! Are you an amateur photographer or have some guidance for us amateur photographers? Come share at Photog Show and Tell monthly link party! The link party goes live on the third Tuesday of the month and is live for three weeks. Next one goes live this Tuesday! Check it out! You got some really great shots! I'm really impressed with how awesome they are SOOC! I think the bleeding hearts one was my favorite. 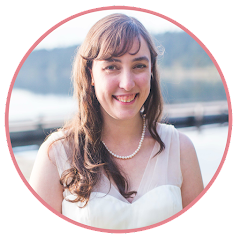 I'm looking forward to your photography link up so I can find some more tips! Have a great weekend, Bethany!! Hooray!!!.. You posted photos.. I really like your shots so was glad to see this blog post. So many interesting things to capture there it would have been hard to narrow it down. Is this like a community-co-op place where different people tend their own plots? I almost always post SOOC pictures but for the past few weeks I have been using the trial of Lightroom 4 (Adobe) and playing around with different presets..I really like how a small tweak to the picture brings out the color, clarity or tones..I already know I will purchase it when my trial is up (see already being sucked in to the money pool of photography)..
these are all really good shots and would look great in a newsletter about the farm! Thank you! I was really happy with how well these have turned out. Have a great weekend, friend! Hugs! Yay! Finally got them posted. I was so happy with how they turned out. Looking at the histogram really helped in getting the right exposure (shooting on manual mode). I typically tweak my pictures afterwards in one of the free programs. That is exciting that you are working in Lightroom! Is it pretty easy to figure out? Or are you planning on taking some classes? The P-Patch was historically a farm and I guess the soils are incredibly fertile. They decided to make it an urban farm. We have lots of P-Patches throughout the City, but I think this is the largest. 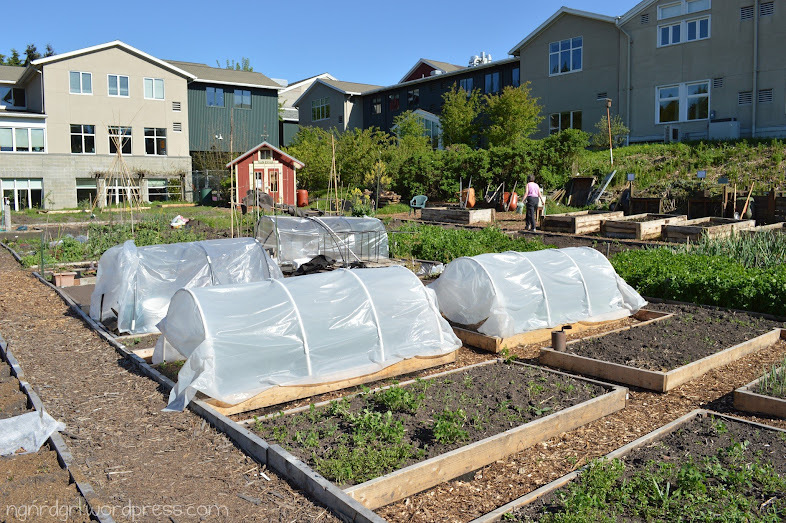 Typically a p-patch might be one house property or a small area in the public right of way. I believe the P-patches are operated through our City Parks department. You can rent out plots for a fee. Its a great way to have a garden in the City if you don't have any space at home (like us apartment dwellers) or if you prefer being part of a community of growers. I think they have communal tools and classes. Lightroom is so easy.. I did watch 3 or 4 Adobe video tutorials before starting and would refer back to them when practicing..It's really easy and I have to admit as far as post processing the pictures turn out really nice..